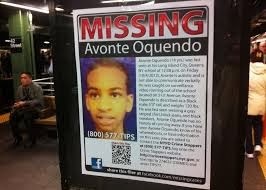 A city-wide search began last October for 14 Year-Old Avonte Oquendo, the autistic boy who disappeared from his Long Island City, NY middle school. Avonte was last seen on his school's security cameras running out of the building. His parents immediately sought the public's help, and extensive media coverage and a search team were put into place. Donations poured in toward the reward, for the boys safe return. Those donations sky rocketed to $95,000. In mid-novmeber the organization in charge of the donations asked the public to halt their contributions. Many feared that whomever was holding the boy, was awaiting the reward amount the dramatically increase before turning the boy back safely. This story consumed the news and New Yorker's. Flyers were posted at every subway station and all around the city. I personally paid close attention to the faces of young boys on the train, to see if they resembled young Avonte. Avonte's level of autism left him unable to verbally communicate. He had disappeared in the past and had a fascination with trains and the subway. So many thought that Avonte was in the subway and would ultimately be found there, safe and alive. (WABC) -- DNA has confirmed the remains found in Queens are Avonte Oquendo, the Medical Examiner says. His family has been informed. Qquendo's mother was notified early Tuesday afternoon, officials said. Word comes after searchers found a skull in the waters off College Point, Queens over the weekend. A second arm and teeth were also recovered from the river, along with clothes matching those worn by Avonte. Other remains were found on a rock in the water near the College Point Yacht Club around 7 p.m. Thursday, about 11 miles from where Avonte was last seen. The 14-year-old was last seen on video tape walking out of his school in Long Island City in October. Police responded to a 911 call in the vicinity of Powell Cove Boulevard and Endeavor Place after a 14-year-old girl stumbled across the remains. A pair of sneakers and jeans were found that matched what Avonte when he disappeared. They are the same sizes that Avonte wore. This story makes me sad. As a child my parents entrusted my safety and well-being to my school (building, faculty, security, etc.) for eight hours a day, five days a week. Avonte's parents did the same. They placed their trust in a school that was supposed to be a safe haven for austic children. The fact that Avonte was able to freely run out of his school and now wind up dead, is devastating. Many people pressured Avonte's family to take legal recourse against the school, but his family was so hopeful that Avonte was still alive, they decided to delay legal recourse until Avonte came home safe and sound. Today is a sad day for Avonte's family. Despite the sadness and pain they feel today, I hope that this will help them find closure and take the necessary actions to ensure that no other family faces this type of tragedy.